Past Life Analysis – Know More About Your Previous Births! Past life analysis shows your Karmic connections between your past and current births. Past life analysis explains the questions that have haunted you in this current birth. Who was I in my past life? Will my previous birth Karma be carried forward to this current birth? If such questions haunt you, put your mind to rest by getting a free past life analysis of your birth chart. Know more about the effects of past birth occurrences on this lifetime. Learn how to avoid the bad effects of past lives and overcome obstacles with this free past life reading! What Does My Past Life Analysis Have To Reveal? Astrological perception can assist you in recognizing your past life beginnings of your current concerns, the best way to destroy these habits and how to learn from your earlier incarnations in a beneficial manner. The nodes of the Moon, when perceived and comprehended the right way help you in analyzing you past, present and future. Past Life analysis or Karmic astrology can help in revealing the very best out of anybody if they are able to acknowledge that it really is time to choose a path purposefully and deal with disadvantages and at the same time trying to improve. This can be clearly be more difficult to accomplish than imaginable, but if one put’s their mind to it, it shouldn’t be too hard to accomplish. The South Node discloses the presents that you are born with in this present life, the things that make you happy and comfortable and activities that come naturally to you. You will be naturally great in the spheres of life that you are accustomed to, based on the Moon’s South Node position in your birth chart. While this could make you feel at bliss, but this is not enough to give you ultimate happiness. You usually tend to get bored once you have achieved your goals as they came easily to you, thanks to your accomplishments in your past lives. The North Node is exactly the reverse of the characteristics controlled by your Moon’s South Node. The North node position signifies the path that is available to you but ultimately you need to do the walking. You will only reach your goals if you make the required effort. For this you will need to give up the emotional baggage from your previous birth and learn as you go ahead in life. There may be tough times, times when nothing seems to work out right, but keep going strong and you will definitely come out successful. Once you have faced the worst, you will realize how much you have achieved in your struggle. Be clear about your goals in life and strive forward. A past life calculator finds the positions of the Moon’s north node and south node in your natal chart that predict about your past life Karma, current birth issues and how to make your future happy. So what are you waiting for? Try this free online past life analyzer and get immediate answers to all your unanswered questions. 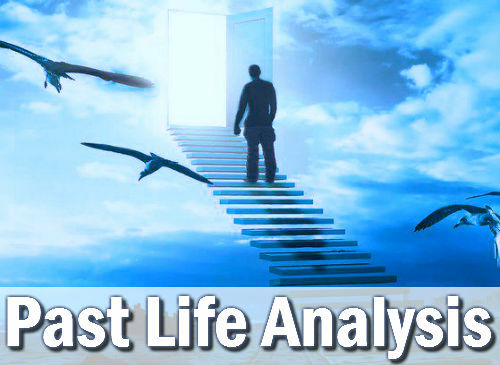 This free pastlife analysis can change your life in seconds! Accurate, what do you you mean by dependence on substances? Very Accurate and Informative! Thanks! It says I have no reading because of no retrograde planets. Of course I'm going to award it ONE STAR! this is my life and these insights are encouraging because only when we can see what is not right, only then can we focus on making it right. Very good. Gave up on substances a long time ago. sab kuch sach h boss.... one should try it. Doesnt sound anything like me. Almost Real facts prediction.This is now happening to me. My god, you are spot on, 100% accurate,thank you and loads of best wishes to you. Almost correct. Hats off to the astrolger. I honestly do remember three of my past lives and your reading could not have been better. Thank you. This is just me, the accuracy is astounding.Thanks for the good Job.